g., preformatted code). 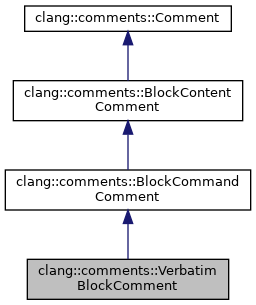 Verbatim block has an opening and a closing command and contains multiple lines of text (VerbatimBlockLineComment nodes). Definition at line 891 of file Comment.h. Definition at line 898 of file Comment.h. Definition at line 910 of file Comment.h. Definition at line 914 of file Comment.h. Definition at line 906 of file Comment.h. Definition at line 927 of file Comment.h. Definition at line 931 of file Comment.h. Definition at line 935 of file Comment.h. Definition at line 918 of file Comment.h. Definition at line 923 of file Comment.h. Definition at line 893 of file Comment.h. Definition at line 894 of file Comment.h. Definition at line 895 of file Comment.h.